of well potted ovoid form with steeply rounded high shoulders surmounted by a short concave neck with wide mouth and rolled-out lip, the plain sides tapering to a solid foot with narrow beveled edge, the cover of shallow domed shape with flat splayed rim and bud-shaped knop, the inner flange of the cover very well fitted to the mouth of the jar, the jar and cover with a glossy transparent glaze on both the interior and exterior, the glaze very well controlled and extending all the way down to the edge of the foot, the flat base of the jar and the inner rim of the cover left unglazed revealing the dense white porcelaneous body. A white-glazed stoneware jar and cover of very similar form is illustrated by Watson in Tang and Liao Ceramics, London, 1984, p. 164, fig. 152, where the author comments: “With their perfectly controlled ovoid profile, the wan nian jars are among the finest wheel-thrown work of the potters of Hebei.” The term wan nian guan, (literally: ‘ten thousand years jar’), is cited by Watson as the Chinese name for this classic vessel shape, which was produced in every region of Northern and Central China, ibid, p. 112. The same white-glazed stoneware jar and cover is illustrated in Chinese Ceramics in the Idemitsu Collection, Tokyo, 1987, no. 23, described on pp. 284–285. A glazed white stoneware jar and cover of very similar form excavated at Beiyaowan, Gongyi city, Henan province from a Tang dynasty tomb dated to A.D. 851 and now in the Henan Institute of Cultural Relics and Archaeology is illustrated by Zhang Bai (ed.) in the Zhongguo chutu ciqi quanji (12) Henan (Complete Collection of Ceramic Art Unearthed in China, Vol. 12, Henan Province), Beijing, 2008, p. 49, no. 49. 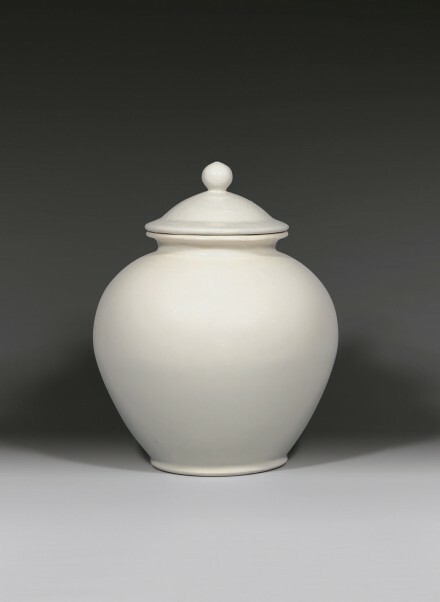 A glazed white jar of closely related form without cover, described as “white porcelaneous ware”, was exhibited at The Nezu Institute of Fine Arts, Tokyo, in 1988 and illustrated in the catalogue Tang Pottery and Porcelain, Tokyo, 1988, p. 30, no. 19, with description on p. 80 and English caption on p. 152. Compare also the smaller glazed stoneware jar of this type, also without cover, illustrated by Krahl in Chinese Ceramics from the Meiyintang Collection, Volume One, London, 1994, pp. 124–135, no. 205.